Rukus Cycling is a Premier Indoor Cycling Franchise, with a technology driven focus utilizing live leaderboards, ride statistics, online class booking, class package purchasing and in class seat selection. Offering state of the art equipment we wanted to build them a state of the art website. 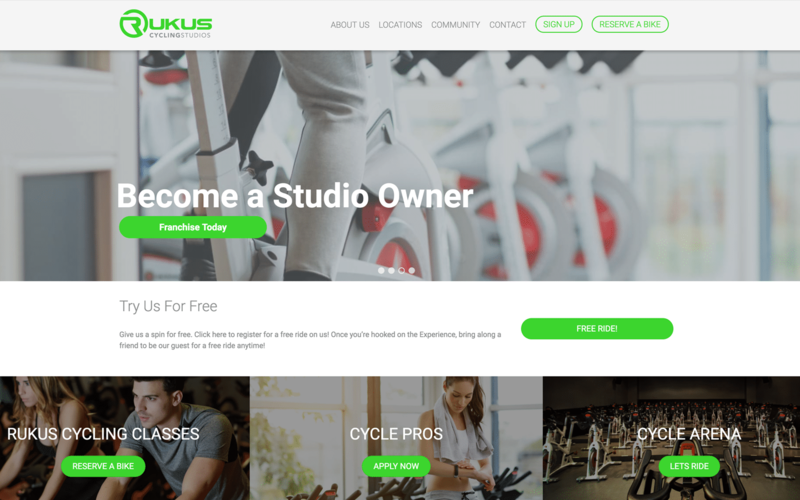 Rukus Cycling Studio needed the ability for their state of the art cycling centers to have a website for online bookings at multiple locations. They had an online booking provider that needed to be plugged-in to a website with multi-location conversions in mind. We built a website that utilized the online booking program built for the studios. The website allows for you to pick a time, bike, and instructors. The site is built to convert visitors to clients and to get potential clients to sign up more quickly. We worked with Rukus on setting up locations with usability being the top priority.